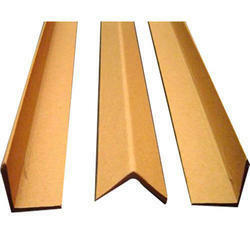 Providing you the best range of edge board and angle edge board with effective & timely delivery. Edge Board are able to offer complete resistant to moisture and is perfectly suited for overseas shipments by sea. This product is manufactured from the best in class material & modern techniques in adherence with the set norms of industry. Offered products are provided in various specifications as per the requirements of the customers. With a precise understanding of the relevant industry, we introduce ourselves as the leading of Angle Edge Board. Our offered angle board is manufactured with multiple pipes of laminated paper board which are glued and treated to form into rigid right angles. The angle board offered by us is checked on varied parameters for supplying fault free range. Furthermore, customers can avail this angle board in different specifications as per their needs. Every time a product is handled, it is at risk of incurring damage. Angle board used in conjunction with strapping or stretch film, helps create a tight, secure shipping cube to contain loads and prevents damage due to shifting during shipping and handling. Angle board provides a buffer between the load and strapping to permit high tension without damage. Reduces indentation caused by strapping. Angle board reinforces loads to stack higher for maximum utilization of warehouse space. Reduces product damage from crushing in stacking applications. Unitization with Angle board reduces product damage incurred during shipping, handing and storage. Improves profits by reducing customer rejection and optimizing transportation and handling costs. Outer diameter protector protects the fragile outer edges of paper rolls, foils etc., from handling and transportation damages. Available in standard lengths and thickness or can be custom made. Eye Protector provides protection from C hooks, strapping, chains and various other handling products. Eye protector can also be made to customer specifications. 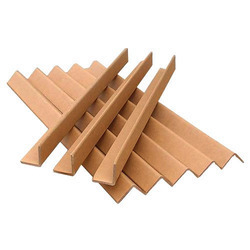 Angle board material is made from multiple plies of laminated paper-board that are glued, treated and formed into rigid right angles to exceptional strength. Looking for Edge Board ?